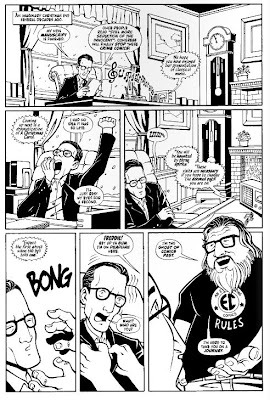 Comics Experience Blog: A holiday gift From CBLDF -- produced by Comics Experience creators! A holiday gift From CBLDF -- produced by Comics Experience creators! For the holiday season, the Comic Book Legal Defense Fund (CBLDF) released a special treat, and it was produced by Comics Experience alums and Creators Workshop members! "A Comics Carol" is written by Joe Sergi (alum & Workshop member), with art by DaFu Yu (art alum), and lettering/design by E.T. Dollman (Workshop member). In the minicomic -- available for free on the CBLDF site, Messr. Fredric Wertham is visited by the Ghosts of Comics Past, Comics Present, and Comics Yet to Come! Congrats to Joe, DaFu, and E.T. -- and Happy Holidays to all!